Men and women tend to view household priorities differently. Johanna Wong of the University of Sydney highlighted how men and women view household decisions differently. In her qualitative work, men and women had different opinions about whether to sell their chickens. Women tended to want to keep the birds for food, while one man in her study said, “Eating meat is like eating money.” Hiwot Desta described similar work from the International Livestock Research Institute. Through focus groups in Ethiopia, her team found that men and women gave different reasons for valuing goats. More men thought that goats were important for income, while more women thought that goats were important for their nutritional value and for the consumption of meat and milk. Involvement in agriculture can be both empowering and disempowering for women. 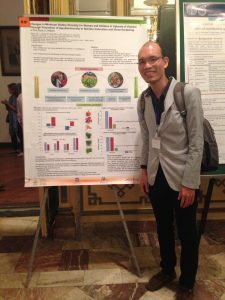 Hoang The Ky presents his team's research on how promoting agrobiodiversity impacts dietary diversity in women and children in Vietnam. 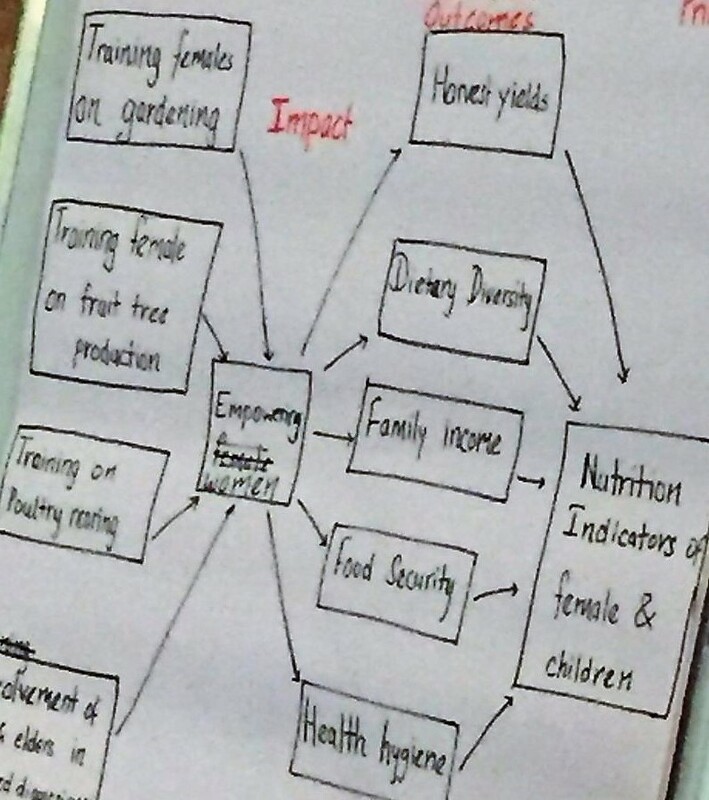 Involving women in agricultural interventions can both empower them and improve nutrition. 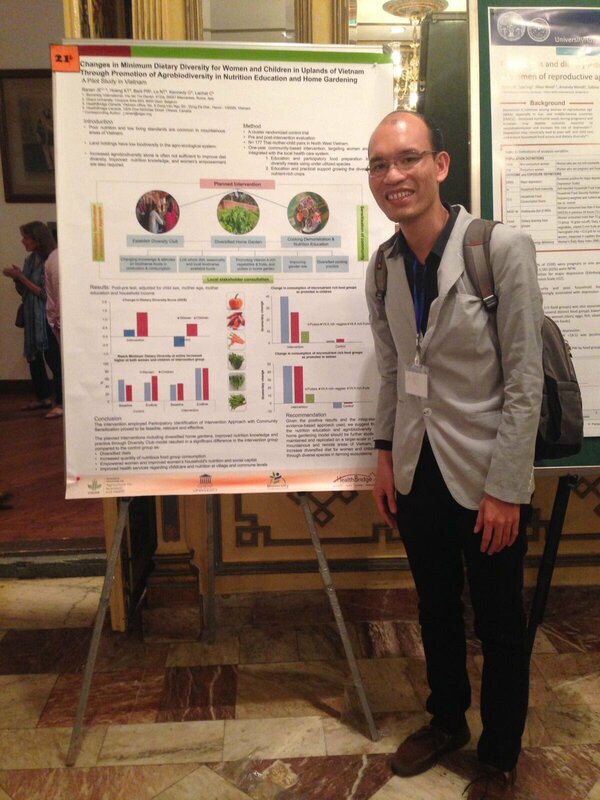 Hoang The Ky of HealthBridge, Bioversity, and A4NH Vietnam shared research about how home gardening and nutrition interventions increased dietary diversity and improved women’s empowerment and social capital in Vietnam. Isabel Madzorera of Harvard University presented results from the Agriculture to Nutrition (ATONU) project showing that women’s empowerment was associated with dietary diversity in Ethiopia. Sabine Gabrysch of Heidelberg University outlined the evidence collected so far through the Food and Agricultural Approaches to Reducing Malnutrition (FAARM) project in Bangladesh, which uses training on homestead food production to improve nutrition and empower women. She noted that a community’s gender dynamics can help us understand why the homestead food production model works better in some areas. Yet involvement in agriculture is not always empowering for women. For instance, male out-migration leaves women with responsibility for agriculture, in addition to their work caring for the home and children. Poshan Dahal of Tufts University described his work on male out-migration and household food security in Far West Nepal. In Maulali, Nepal, 80 percent of men migrate to India for work, generating income for their families but leaving women with responsibility for their farms. The men retained decision-making power, however, calling home on cell phones to direct household and agricultural decisions and purchases. Gender-sensitive research is about men as well as women. Participants discuss nutrition- and empowerment-related impacts during an A4NH-led learning lab on the project-level Women's Empowerment in Agriculture Index. 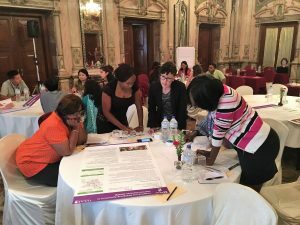 Policymakers from Leveraging Agriculture for Nutrition in South Asia (LANSA) described the “patriarchy mindset,” that defines gender roles and shames men who take a larger role in household chores such as laundry and cooking. Social norms keep men from helping with these tasks, so women – many of whom are also involved in agriculture – are often left with full responsibility for the household and child rearing. When men migrate, this burden can further increase. Hazel Malapit, Jessica Heckert, and Elena Martinez of the CGIAR Research Program on Agriculture for Nutrition and Health (A4NH) led a learning lab about the project-level Women’s Empowerment in Agriculture Index (pro-WEAI), which diagnoses key areas of women’s and men’s disempowerment in agricultural development projects. Maternal, infant, and child health and nutrition are all interconnected. Elaine Ferguson described LANSA’s research about the relationship between women’s work in crop agriculture and maternal and infant nutritional status. In rural Pakistan, cotton is the largest cash crop and the time- and labor-intensive harvesting is done almost exclusively by women. In this study, picking cotton during pregnancy was negatively associated with both maternal BMI and infant growth. Thus, interventions to improve infant and child nutrition should consider the tradeoffs between household income and maternal health. We must consider equity both within and between households. Hellen Harris-Fry of the London School of Hygiene and Tropical Medicine shared research on intrahousehold food allocation in rural Nepal. Her team found that calories were allocated inequitably between family members, and wealthier households did not allocate calories more equitably. Erin Lentz of the University of Texas at Austin found that factors such as health-seeking behavior, food allocation, domestic violence, and allocation of common pool resources can all impact women’s nutrition, and these determinants vary within and between households. Using this formative research, Lentz’s team is now working to create and validate an index to measure women’s nutritional empowerment. We need policies that support women agricultural workers, and women must be involved in policymaking. A panel discussion led by policymakers from LANSA highlighted the need for policies that recognize women as farmers and agricultural workers; create gender-sensitive agricultural programs; provide nutrition-focused behavior change; and invest in social protection. Some South Asian countries have made progress on gender-sensitive agricultural policies, and effective implementation of these policies will be key to their success. 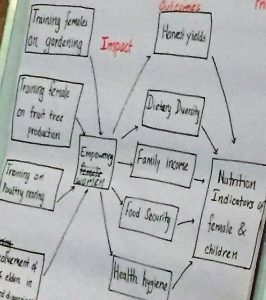 To support these goals, LANSA is working to generate gender-disaggregated data about agriculture in South Asia and promote large-scale gender sensitization.